Ted Dooley is the Executive Director of the College Republican National Committee. 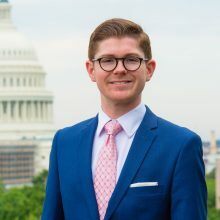 Prior to that, he served as the organization’s National Co-Chairman, Regional Vice-Chairman, and was a three-term State Chairman for the Massachusetts Alliance of College Republicans. Aside from his work with College Republicans, Ted most recently worked as Vice President of Merrimack Potomac + Charles, a full-service strategic communications firm based in Boston and Concord, NH. Prior to his work at MP+C, Ted helped oversee and execute a broad range of strategic communications and public affairs campaigns across New England as a consultant at Purple Strategies New England. Ted began his political career managing and consulting for local and state Republican campaigns in Massachusetts. During the 2016 cycle, Ted served as a digital media advisor to New Hampshire Governor Chris Sununu’s campaign. Originally from Holliston, Massachusetts, Ted is a graduate of Boston College. He now splits his time between Boston, MA and Washington, D.C. with his wife Nicole and their puppy, Kennedy. In their free time, they enjoy sailing and spending as much time as they can on the beautiful shores of Cape Cod.